As Foodie Philip was out in the morning, he stopped at Popeye’s on the way home for the 11 pack special with a large red beans and rice. The red beans and rice is $2.12 per serve with tax. Lunch today was as good as it usually is, for $5.10 per serve. 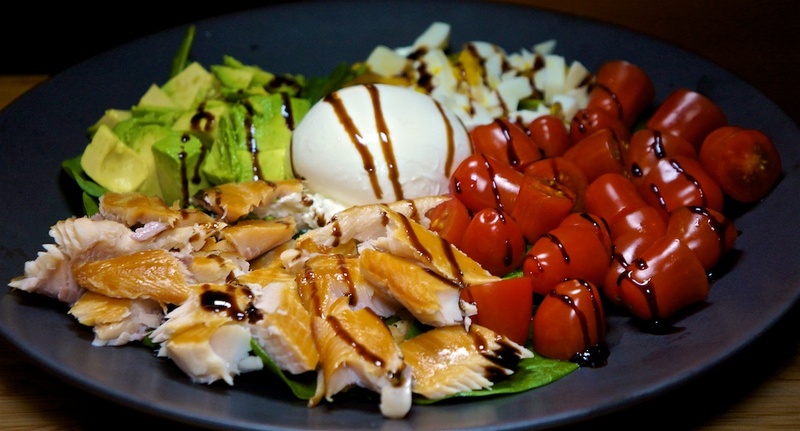 We decided to repeat the Smoked Trout Cobb Salad using the full fillets from Trader Joe’s rather than canned smoked trout. We also decided to drop the bacon from the meal. Tonight’s Cobb Salad was the best we’ve had for $8.75 per serve. Back to a normal Burbank Monday and Foodie Philip was at In and Out Burger for a Double Double Animal Style for $4.27. We still had some of the Kabocha squash that we’d baked and added more to it to create a variation of the Smokey Cheese and Pumpkin Slice, that was a quiche than the savory cake that the recipe normally makes. The recipe still makes four generous serves. An onion adds 8c per serve. Dinner tonight was filling and tasty. Foodie Philip served with some “fry bread” (slices of bread ‘toasted’ with butter in the sandwich toaster), which added 32c to his meal, otherwise it was $2.34 per serve. Due to some strangeness at Maggiano’s that involved an extra past dish that we ultimately bought home, so we reheated it and served with some spinach, bacon lardons and a poached egg. The Alfredo was very good and the egg melded into the sauce for a really rich result. A pastured egg is 55c and we averaged 1.5, or 83c per serve. Lunch was surprisingly good – and a good time to have carbs – for a net cost of $2.71 per serve. We decided to try Pioneer Woman’s Creamy Mushroom Soup and it turned out really well. We got three serves from our modified recipe. Add 30c for onion, celery, garlic and thyme. The soup had a lot of mushroom flavor, which was what we were going for. Excellent for $3.91 per serve. An exact repeat of yesterday so we can finish off the Lentil & Lamb! Add 20c for cocktail sauce. Lunch today was good, with the cocktail sauce being a worthwhile addition. All in lunch cost $2.65 per serve. Friends from Australia invited us to join them at Maggiano’s Little Italy at the Grove. Foodie Philip had the Filet, Mushroom and Asparagus Risotto, which was very good, while Greg had the Veal Piccata, which he also enjoyed. Food was very good, company was excellent and the service friendly and attentive. Just what you want from a night out. Our friends paid for dinner. Today’s toasted sandwiches repeated the Lentil & Lamb with Hummus and Turkey Pastrami, except today we added a little cocktail sauce to the Turkey Pastrami to make it a little more like a Reuben (or more correctly, since it’s made with Turkey Pastrami, a Rachel). Time to slice and fry the remaining chili meatloaf. 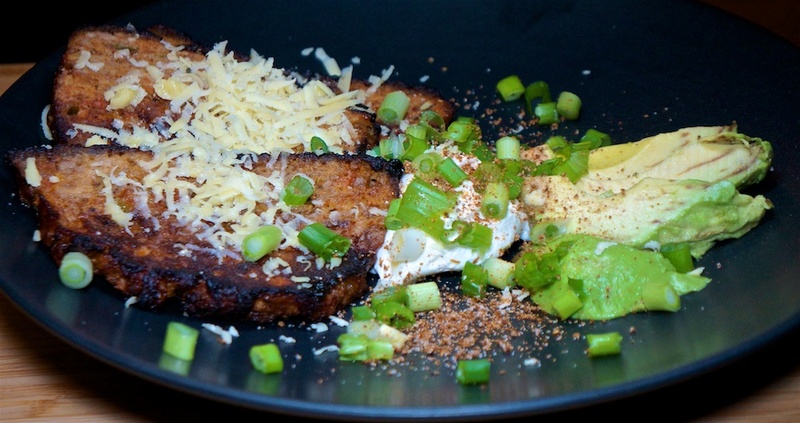 We decided to treat is as if it were chili and serve with avocado, sour cream (labné), cheddar and spring onions. It worked really well and the meatloaf fried off with a really good crust. Add 10c for spring onion. Dinner tonight was really tasty. 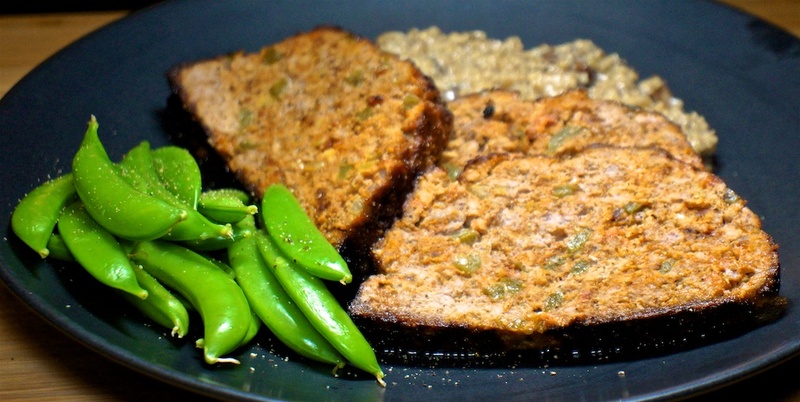 The crust on the meatloaf added a lot of texture and flavor, with the sides adding balance to the dish. Good eating for $6.32 per serve. A gray, windy day is soup weather and today Trader Joe’s Clam Chowder, made with half and half, and a freshly baked rustic roll really hit the spot. The Half and Half is $1.39 per pint, and we used 3/4 or 53c per serve. It was a very satisfying lunch for $2.01 per serve. Thursday night “steak” night was dedicated to pork chops from our Prather Ranch meat delivery. Two small chops were souse vidé to just below cooked, then fried off in butter to get a golden brown finish, over which we drizzled a balsamic reduction. We served with baked kabocha squash, which was new for us, and sugar snap peas. We liked the squash. The skin was crispy and the flesh full of flavor without being at all mealy. Sugar snap peas were $3.99 but we only used half, or $1.00 per serve. 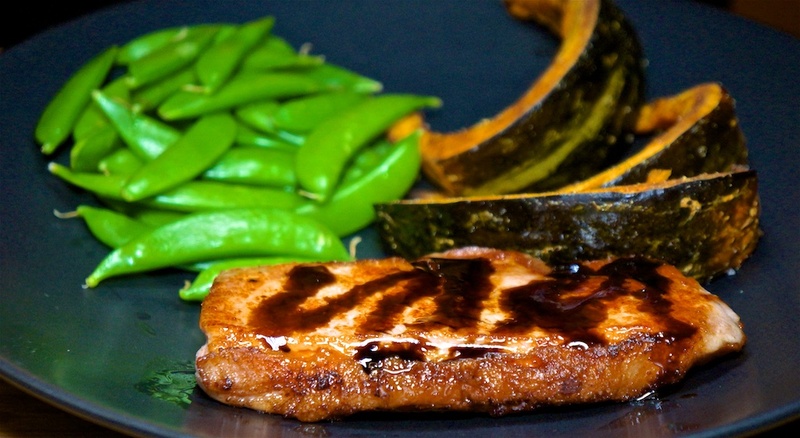 A thoroughly enjoyable meal with a good balance between the pork, squash and sugar snap peas. The combination of peas and squash was particularly good. Most enjoyable for $7.89 per serve. Once we have a ripe avocado we need to make two sandwiches with it before it goes off, so today we paired half the avocado with a pouch of lemon pepper salmon on one and sun dried tomatoes, avocado and turkey breast on the other. 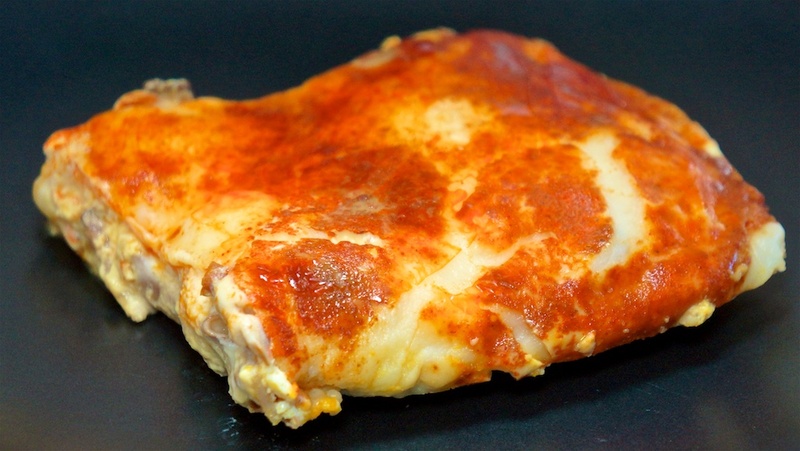 The turkey breast was almost redundant, adding little to the flavor or texture. Today’s sandwiches were very tasty with both of us preferring the avocado and sun dried tomatoes, even without the turkey breast. Not bad for $3.19 per serve. Tonight was LACPUG night so we eat pizza at Polermo’s afterwards, and all contribute $5.00 each. Today’s toasted sandwiches: Crispy Lamb & Lentil with Hummus, and a sliced turkey breast, mayo and cheese. Todays sandwiches were both interesting and tasty for $1.43 per serve. Tonight we tried a new meatloaf recipe, although slightly modified because of the amounts of meat we had on hand. Mushrooms were $2.29 or $1.15 per serve. Dinner tonight was good for $7.96 per serve. Although it was a Monday, the normal schedule was being disrupted by the need for new tires on our car, so Foodie Philip took a sandwich with him and ate it at the tire shop! Both sandwiches were tasty and satisfying for $1.35 per serve. Tonight we used the remaining Southwest Beans and Sausage from a few nights ago. Dinner tonight cost $2.78 a serve. Surprisingly the andouille sausage seemed to have lost its flavor in the storage period. Because it was the weekend we added egg(s) to our flatbread quesadilla with the cider braised pork. Eggs are 55c each or 82.5c per serve (average). Lunch today was a good quesadilla for $2.91 per serve. It turns out that the kedgeree that we’ve been having isn’t particularly authentic, so when Foodie Greg came across Jamie Oliver’s recipe for a more authentic kedgeree, we decided to give it a go, with our new favorite fish: smoked trout. For us the recipe served two, but we used a lot less fish and about the same amount of rice, and we dropped the yoghurt and coriander. Add 25c for the remaining ingredients. 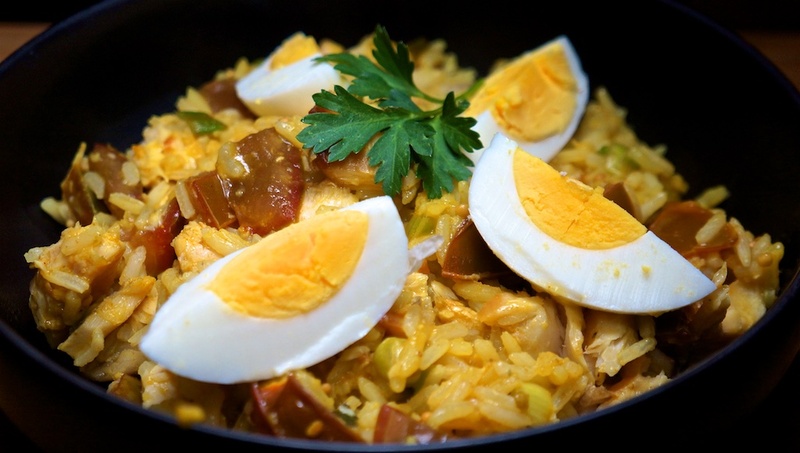 This kedgeree was very different from the Anglicized Kedgeree we’ve been cooking, but with the smoked trout this was exceptionally good for $5.83 per serve.